Care by Design is a company that always strives to offer CBD-rich cannabis products in easy-to-use sublinguals, topicals, gel caps, vaping products, edibles and concentrates. The main ingredients used for making CBD/THC Soft Gel Caps – 18:1 are Cannabis oil and Coconut oil. 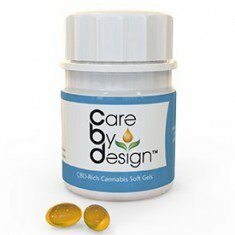 Care by Design cannabis oil products are cleanly extracted using a supercritical CO2 method. Their products are lab tested to ensure the highest quality and safety. This company’s products are tested for cannabinoid and terpene profiles, potency, and contamination. It is verified that each bottle contains a consistent amount of active ingredient for reliable dosing. Care by Design cannabis oil products are 100% organic and they are sourced from local, sustainably grown cannabis. CBD is used in a wide range of medical applications. Patients suffering from psychological disorders such as anxiety, psychosis, depression and other mood disturbances can benefit from it. • Each bottle contains 5 capsules: 100mg in total. • 20.8mg CBD and 1.17mg THC is used in one capsule. • 10mg of CBD each on a ration of 18:1, CBD: THC.